....well may be you should take a closer look at this. The shear magnitude of investment into this project is immense...and all of the pricely sum of $45 billion. On the face of it investors have the right approach, with the long term aim of generating sustainable work into Egypt. The weak pound has an upshot. Not only are UK manufacturers seeing an upsurge in exporting, but there is continued interest in foreign investment into these shores - far eastern interest in the now devolved Sheffield area; china's investment in Hinkely Point and another proposed power station in Essex. 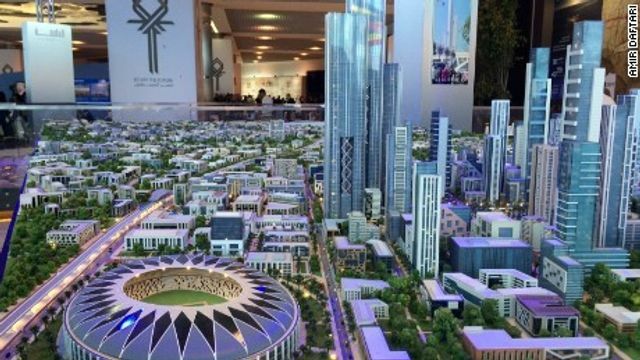 (CNN)Egypt's new capital city moved a step closer to reality with the announcement that Chinese developers will largely fund the megaproject. The China Fortune Land Development Company (CFLD) agreed to provide $20 billion for the currently unnamed city, after a meeting between heads of the firm and Egyptian President Abdel Fattah El Sisi. This follows a previous commitment of $15 billion from another Chinese state-owned company, bringing the project close to its $45 billion budget requirements for phase I.